I don’t normally talk about cars in and of themselves on this site, so despite that, or perhaps because of it, this post will cover a lot. Decision making, design, automotive technology, corporate perspective, individualism, aesthetics v. functionality v. pragmatism, collaborative filtering, and others. It’s quite interesting to me the complexities of making such a big decision as buying a new car and what goes into it. This was not an easy decision. The red exclamation point was a nice, added touch. 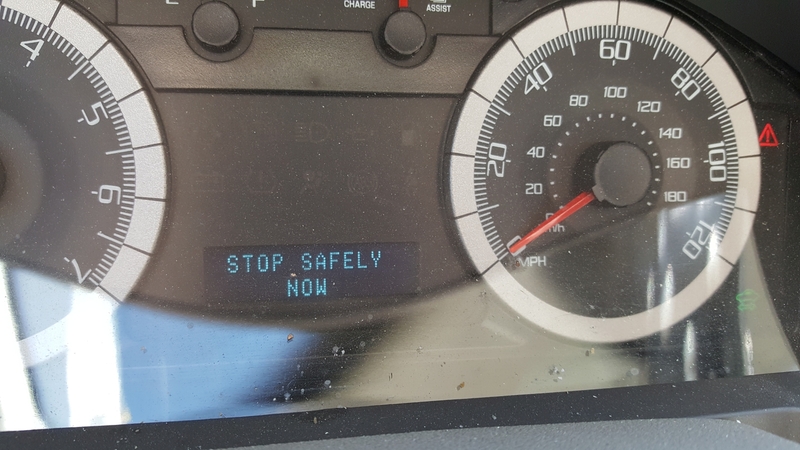 I did stop safely, but it was a little late for that message. That little event could have been fatal, however after shutting off then restarting the car, everything seemed to be fine. I was hoping that would be the end of it, considering a similar event happened years earlier and restarting the car appeared to have eliminated the problem. This time, however, would be different. It happened again. And again. After some research, I learned the problem, and a much bigger potential problem: A component used to cool other electronic components in the car had gone bad. Not only that, someone had died because of it and there was a class-action lawsuit in progress because of it. As the car already had over 100K miles, and other aspects of it had never worked properly, I determined it was time to start the hunt for a new car. I considered many, and for many reasons. I’m not the luxury car type, and didn’t want to overspend, but looked at all my options. Ultimately, the decision came down to the Hyundai Tuscon and the Mazda CX-5. I decided on the latter, but not without some hesitation that I still carry. When there are many options, there is rarely a clear-cut winner, and this particular decision shows the nuanced nature of, and requirement for, an individualistic approach. To set some groundwork, I wanted a crossover SUV, sometimes known as a CUV, or more colloquially – and derogatory, I assume – a cute-ute. (To clarify some terms, an actual SUV uses a unibody truck frame, whereas a crossover utilizes the crossover body on a car frame). At the same time, while I have always driven cars that seem somehow ‘rugged,’ like a Jeep Wrangler, Jeep Cherokee, Dodge Dakota, then the Escape, this time I wanted something that was a little more upscale, something that had elegance to it, while maintaining a slight, subtle edge. There wasn’t much that met those criteria. 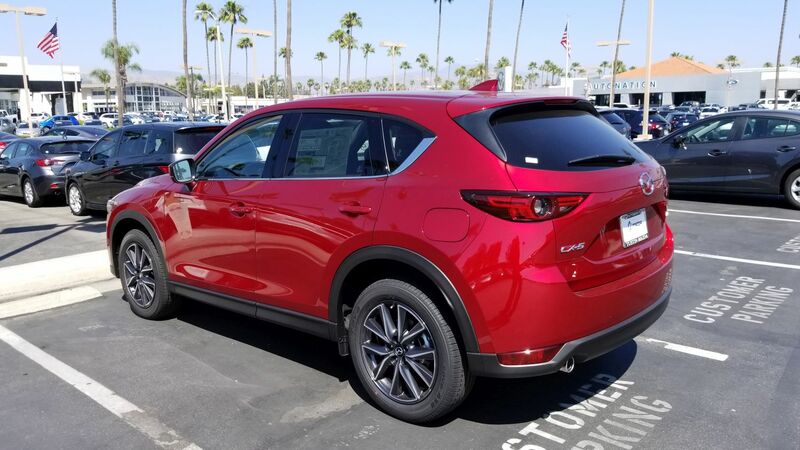 It was easy to narrow down the search to the Hyndai Tuscon, which has an aggressive theme line, and comes with a lot of options, however while I was researching it, I kept seeing reviews – stellar reviews – for the Mazda CX-5. 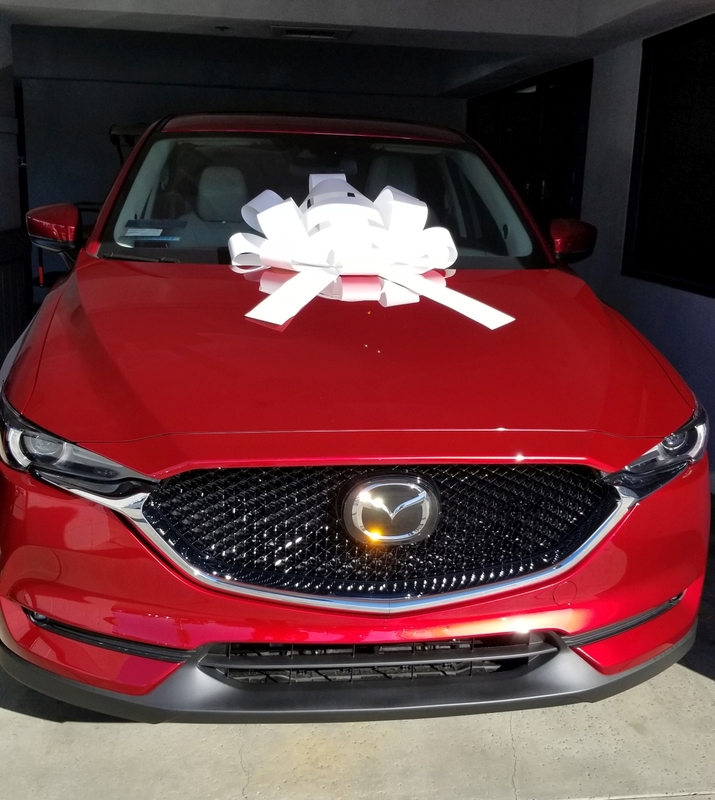 I was ready to buy, but for something like a car you want to evaluate all your options, and I felt I should at least look at the Mazda before making a final decision. I knew nothing about Mazda. I don’t know anyone who drives a Mazda, and I have never known anyone who drives a Mazda. I am, however, beholden to design, and that will become important very quickly. On first approach, the vehicles didn’t move me, metaphorically speaking. 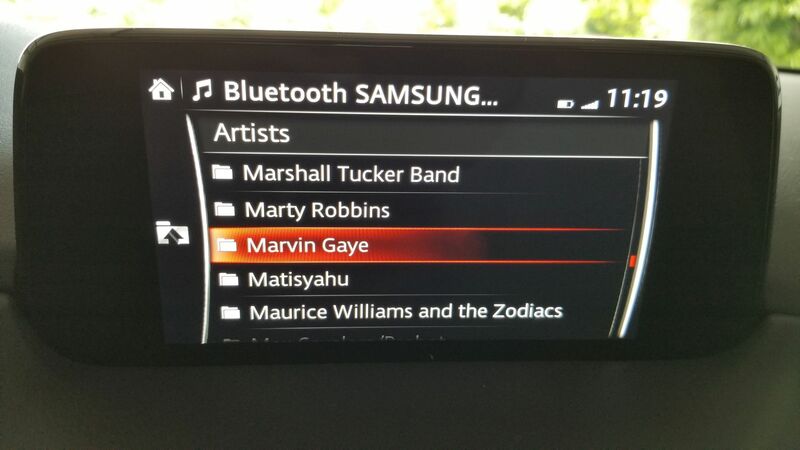 I walked around the car to set a baseline for myself, yet nothing stood out. However, as I returned to the front of the car, I noticed something: A chrome trim running along the bottom frame of the grill. It made a nice accent, especially when the sun hit it, and the floating, prominent Mazda logo, which hides the radar for the radar cruise control, has a nice presence in an understated mesh grill. Following the line of the chrome accent, I now noticed the lines of the car itself, and what do you know; understated yet still with a subtle, aggressive edge. Narrow, down-sloped headlights, slightly wider at the hips, an ever-so-slightly reclined greenhouse and canted grill gives it a look of movement. 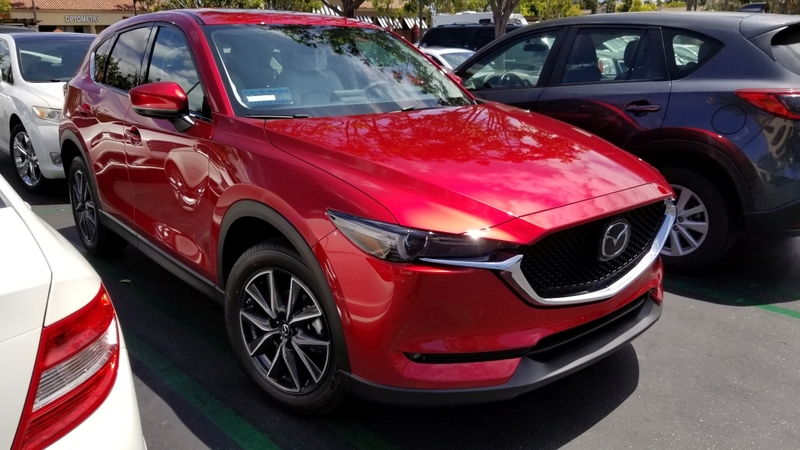 In my search I had also been looking for some kind of pearlescent black, but Mazda’s new three-coat metallic red really shines, both literally and figuratively. I have never been a fan of red cars, but this one is beautiful; absurdly, almost comically chrome red. In the previous two images, be sure to note the commonalities in thematic design between the front and rear lights; I do love a consistent design approach. I was already coming around to the design, but it was the interior that really grabbed me. A wide center console with chrome trim and leatherette boot evokes a luxury-car feel, which is exactly what I was looking for. Chrome-lined air vents, leveled door handles and center console, a dead pedal (totally unnecessary with an automatic transmission, unless you, what, always ride the brake? ), and a tri-spoke steering wheel that looks more sports car than CUV. 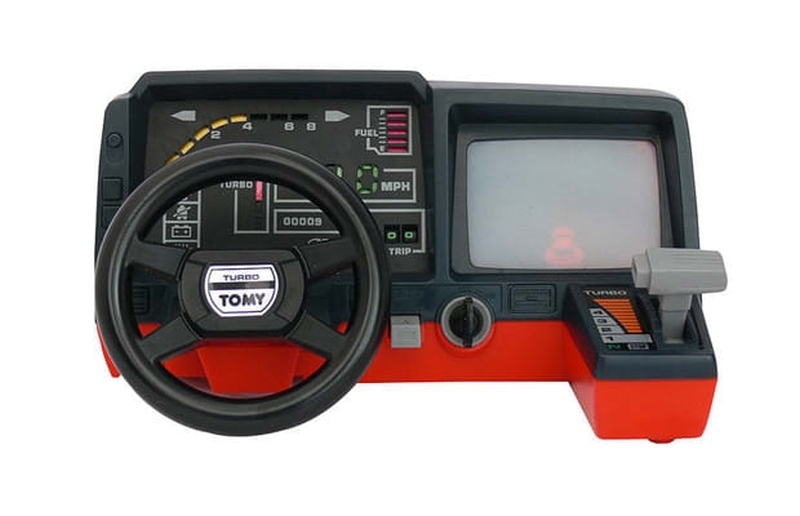 Additionally, unlike most other cars in the class which have two gauges and an info screen in between, this has three gauges, chrome-outlined, with the rightmost gauge being the info screen. That puts the speedometer front-and-center which is exactly where I like it. There’s also double-stitched leatherette and soft-touch everywhere in the black-and white interior which contributes further to the experience. Indeed, the CX-5 is often compared to Audi in terms of its interior feel, and having looked at Audi I honestly believe the Mazda outdoes it thanks to the symmetry and width of the center console. Here’s a shot of the instrument cluster. Remember how I was just talking about consistent, thematic design? The gauge on the right with the MPG rating, trip odometer and gas gauge is all digital, however you wouldn’t know it at first glance. 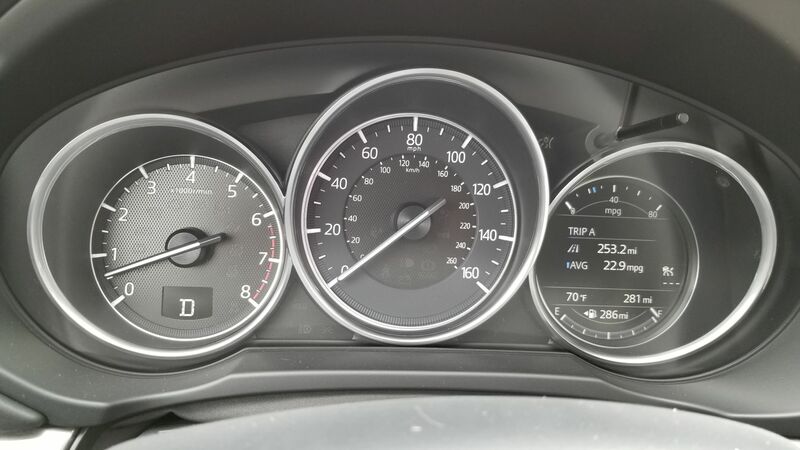 It matches almost perfectly with the other two gauges and leads to a unified, integrated theme, but with the additional functionalities of a digital display (this is also the gauge that is used to set the radar cruise control and contains some other informational screens). It’s beautifully done, even with the physical protrusion used to reset the trip odometer. The CX-5 is compared to the Audi for two other reasons, one of which almost solely sold me on the car, and one of which will likely take some significant getting used to. 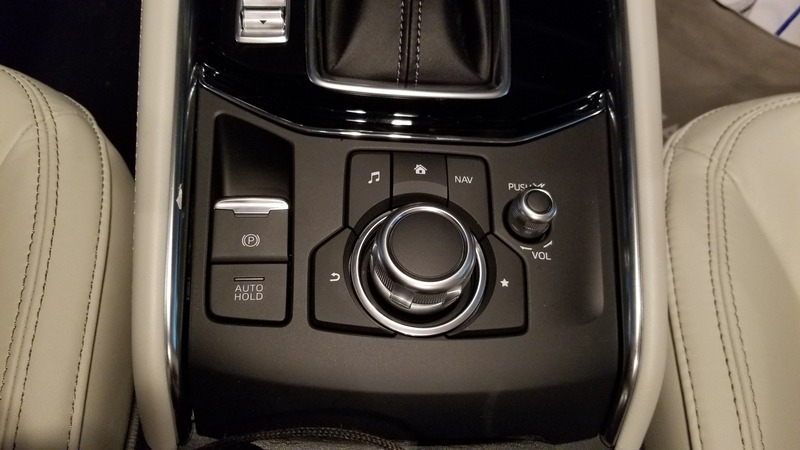 The first is that unlike almost every other car company out there, Audi being a notable exception, there is a physical knob mounted directly in front of the center console that is used to navigate the infotainment system. You can only use the top-of-dash mounted screen as a touchscreen if the car is stopped. Otherwise you have to use the knob, and I love it. I have always preferred physical interaction methods over digital, and it is because of the desire to have that in areas where it is no longer practical, such as smartphones, that we have haptic feedback and vibration and the like. People like the immediate, organic response, the feel of a physical button that responds notably and demonstrably to a press, as opposed to a tacked on vibration, if at all. The dial is both textured and grooved, enhancing usability, and clicks with each turn, just like a well-designed mouse wheel will do, and can be used as a pseudo-joypad for moving up, down, right and left. It can also be pressed in as a selection confirmation. It’s responsive and tactile; you always know that an input has been received. Mounted around it are physical buttons with long-standard iconography that you can use to go home, back, or direct to any one of the main screens (Media, Communication, Navigation). Being able to control all aspects of the screen via physical input that’s easy to reach, where your hand naturally rests, and not having to reach out to a dash-mounted touchscreen, is wonderful. The other reason the car is often compared to Audi, although Mercedes-Benz does this as well, is that rather than have the screen of the infotainment system in the dash itself, it is mounted on top of the dash, as though someone just smashed its vertical edge right in there. 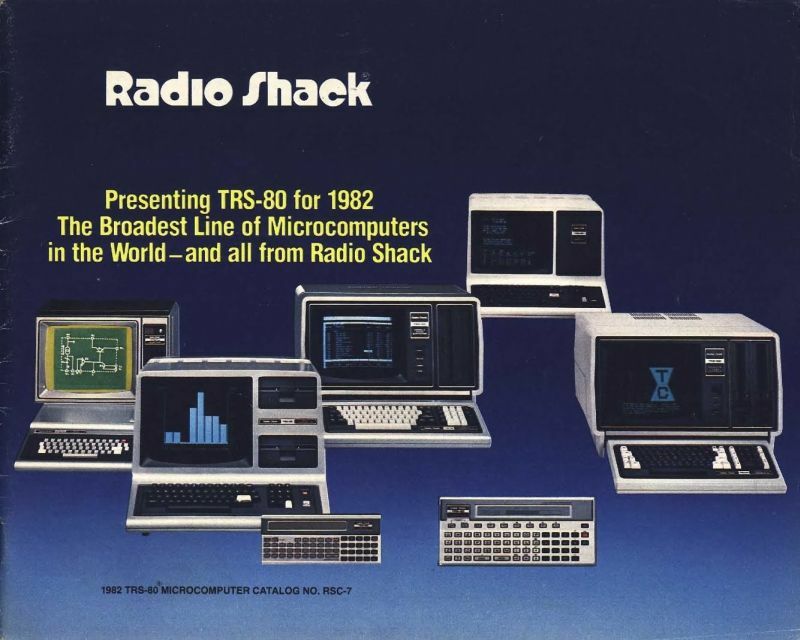 At first I really didn’t like it, it looked clumsy and tacked-on, and I am all about integration in design, but once I overheard someone describe it as ‘looking like a drive-in movie screen,’ I was hooked. I think I’ll add some tiny plastic cars and a little drive-in marquee. The thing I didn’t realize at first is that by having the screen mounted in such a way, your eyes don’t have to travel too far to see it. To look at a dash-mounted screen your eyes travel almost twice as far, and are off the road for longer. The way Mazda has mounted the screen is actually safer, and I find it to be much more comfortable as well. Even with the endless praise I have for the physical input methods the car employs, and the location of the infotainment – a word I really don’t like – screen, the system itself leaves much to be desired. 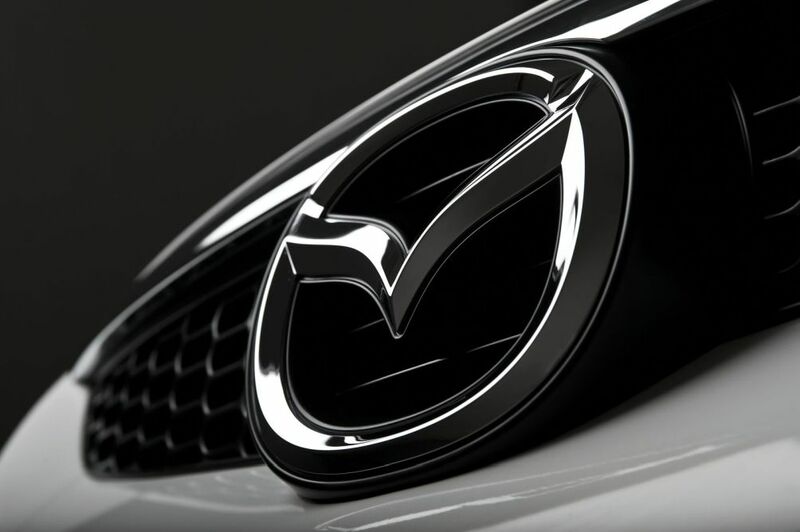 While almost every other auto manufacturer on earth has adopted Apple’s Car Play and Android Auto systems, Mazda stubbornly continues to resist, and this leads to a number of issues that go beyond the lacking software integration. The fact is, Mazda’s system is behind the times. WAY behind the times. It’s slow to boot up, and chugs and skips while doing so. 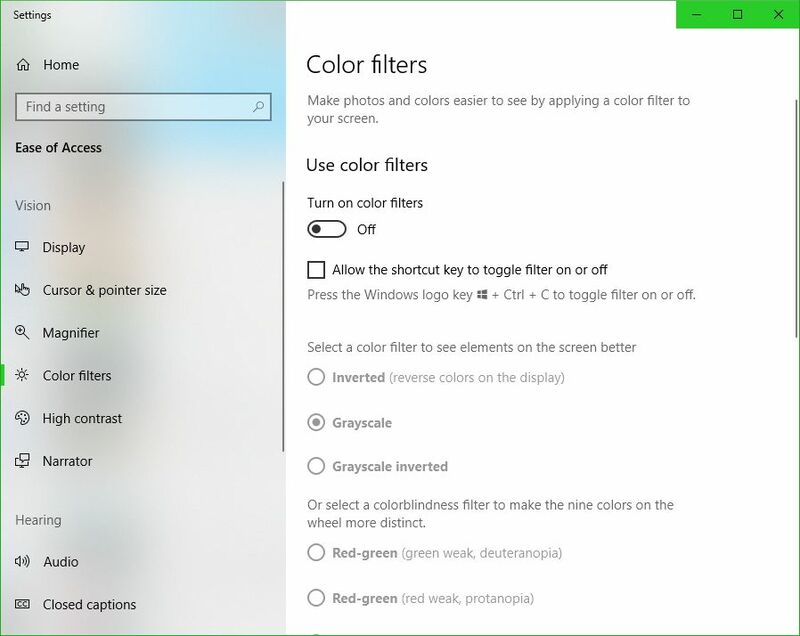 While on first glance it looks quite clean, with only 5 options, navigating within those options can be a chore. For example, I connected my phone via Bluetooth, something they had me do at the dealership, and while the process was easy and worked the first time, issues became apparent almost immediately. Text alerts and calls worked fine, with clear sound on both ends and snappy response, however when streaming music the usability, or lack thereof, rears its ugly head. I have about 700 artists in my music collection, and there is no way to jump to a particular one, or even navigate by letters of the alphabet. So if I wish to listen to, say, Thin Lizzy, I have to use the knob to scroll, and scroll, and scroll, and scroll, and scroll, and scroll, and scroll, and scroll, and scroll, and scroll…you get the idea. You also can’t wrap the scroll, meaning scroll off the top and have the list appear at the bottom or vice-versa, and the tiny red handle in the below image really illustrates how long the list is. The system menus are byzantine but that’s no different from any automaker, or any software at all for that matter. Scrollin’ Scrollin’ Scrollin, keep that songlist scrollin’. Another odd experience is at one point my phone connected, but the car said it couldn’t access media on the phone. It could make calls and receive alerts, but couldn’t see the music and threw an error. However if I played a song on my phone, the song info came up on the car screen and the song played through the car stereo. Very weird. 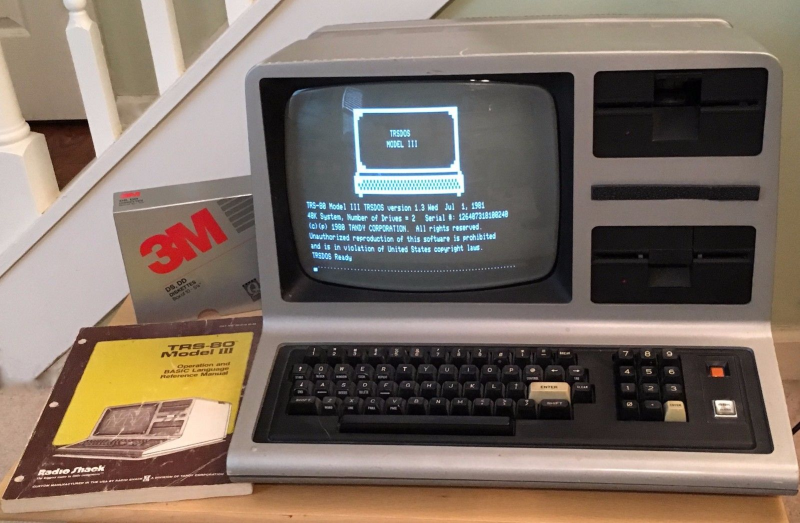 Eventually, and without rhyme or reason, it connected again and all was working fine. 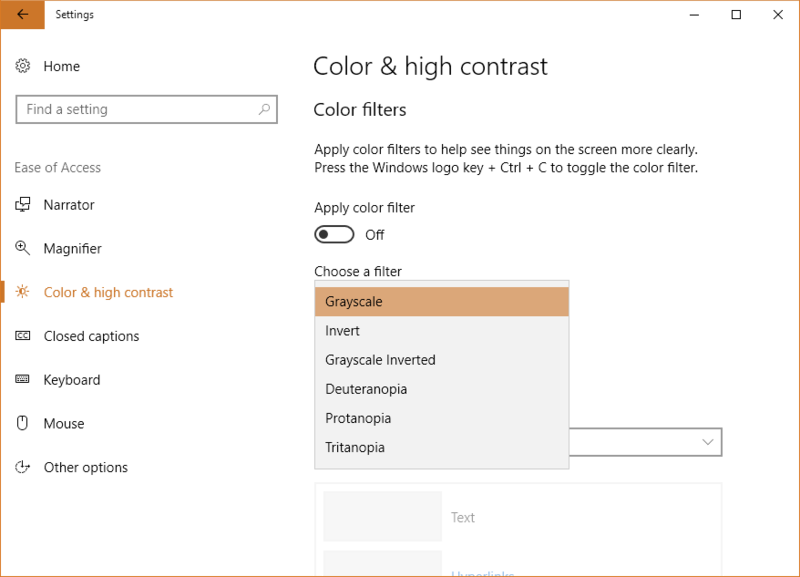 Design concerns continue to abound in the interface, with the main being there’s no flash to the screen. What I mean is, the display is very pedestrian. 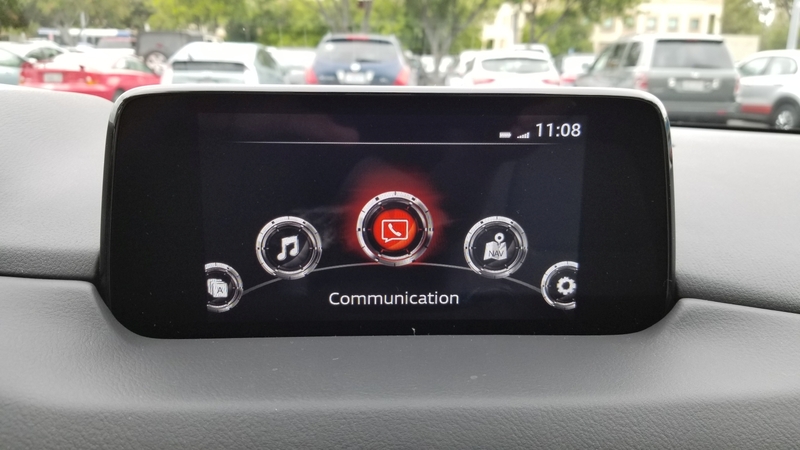 While others (like the Tucson) will show full color images of the XM stations’ logos and has a graphic that looks like a radio dial if you’re tuning the radio, Mazda’s screen is very bland. On top of that, when listening to XM it bizarrely cuts off information about song and artist, even though there’s plenty of room left on the screen. 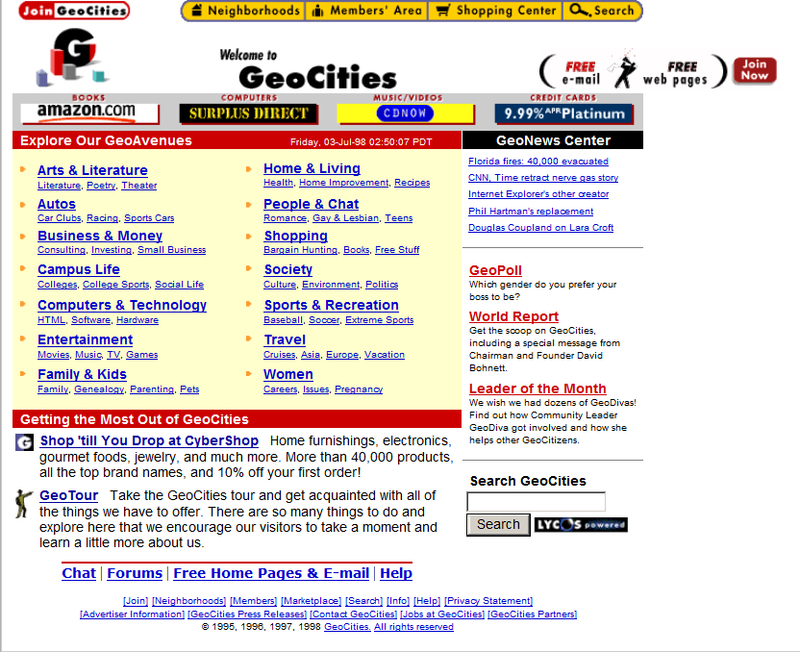 The navigation screen is more lively and functional, but still tough to navigate (get it?) although it does work well once information is entered. When one considers the time and effort they put in to the overall design of the rest of the car, something they call Kodo, it is baffling they have slacked so much with this. Their information screen in the instrument cluster is full color and informative, using images and text to convey information from cruise control to fuel economy, so I am at a loss as to why the dash-based system is the way it is. Again going back to the Tucson, their screen on the top models is eight inches, full-color, and beautiful, although to be fair on lower models, the screen is only a four-incher and much more difficult to see. 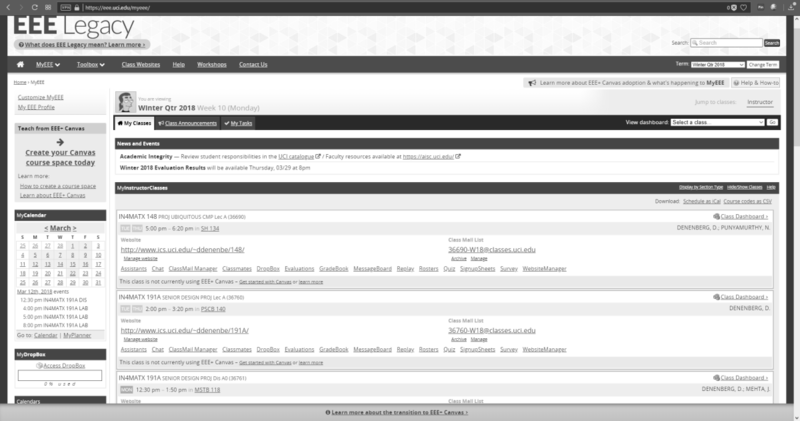 Of course, their screen is also exclusively touch, and navigating up and down on one of those is pure hell. To top it all off, the actual display area of the Mazda’s screen doesn’t utilize the entire surface of the enclosure as you can see in an earlier image. But I hold out hope. There has been significant vocalization from owners regarding this, and earlier this year Mazda informed Cars.com that they would be coming out with an Apple CarPlay and Android Auto update in the future. They didn’t give any exact dates, however the rumor is later this year. The thing is, they would have to overhaul the system to do it. 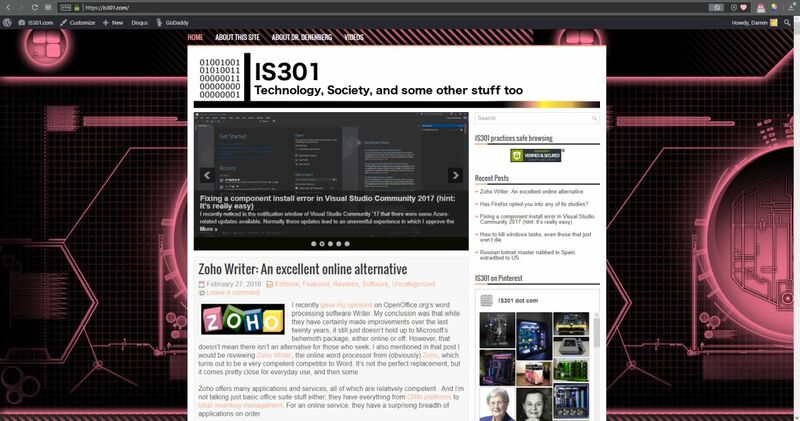 They wouldn’t be able to shoehorn that functionality into the current interface in any meaningful, or non-crap way, so I am hoping when (if) the update comes, it will be a complete refresh to the whole system that reinvents it from the ground up. That would enhance the experience of this car in a big way. 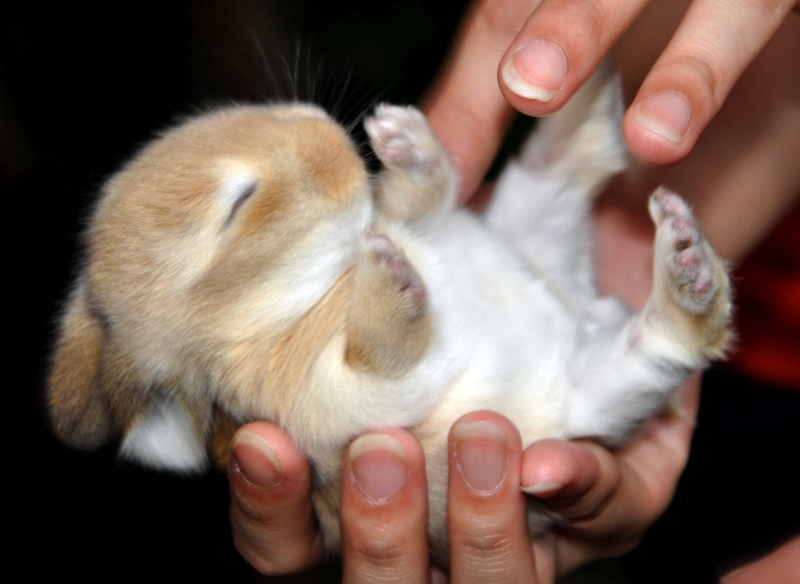 Even with all my criticisms, there is so much to like. Along with my praise for the interior and exterior design discussed earlier, it has keyless ignition and entry with a detachable valet key, the car locks automatically and unlocks via a button in the handle if the key fob is in your pocket. The doors open wider than its competitors to make getting in and getting out – or, if you’re an engineer or designer, ingress and egress – easier. The radar cruise control will allow you to set a car-length distance to the car in front of you, and the Mazda will follow that car exactly without you having to do anything. It will speed up and slow down, even stop, then start again as the car in front of you does. 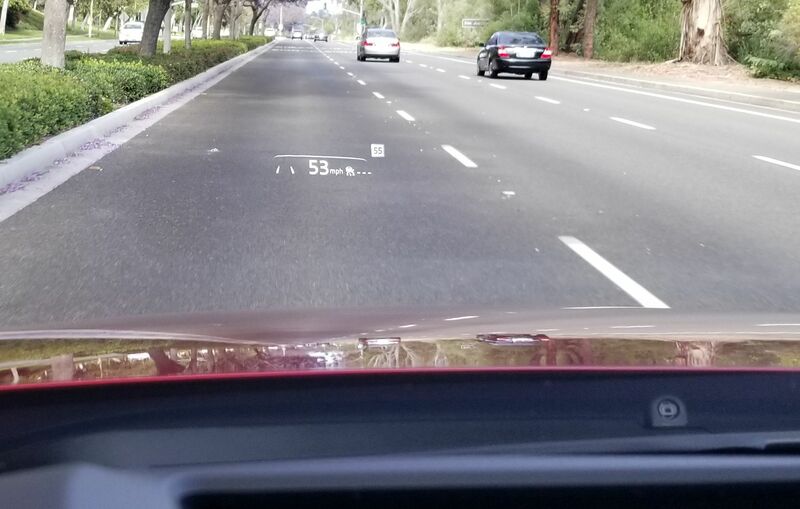 It has a pseudo heads-up display that will show when the car shifts, blind spot alerts, the speed limit, any street signs in view (it will actually show graphics that look like red stop signs, yellow yield signs, speed limit signs with the actual speed limit, etc. It’s a neat feature), your current speed, and navigation arrows if using that feature, and amazingly does it without feeling cluttered. 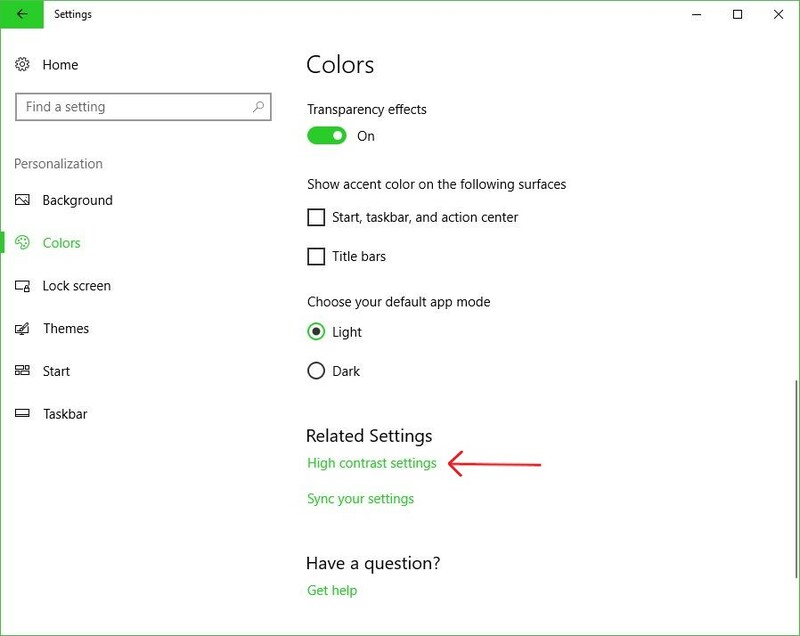 This is a significant safety feature as it doesn’t require taking eyes off the road for status information. The drive is by far the best driving experience of its class, with smooth shifts and almost no roll around corners, which is due to the vehicle’s unnoticeable transfer of weight to the front wheels when making turns, which keeps the car responsive and easy to control; the most apparent indicator of this is that the people inside the car don’t feel a compelling urge to lean into turns. I programmed my garage-door opener to a button on the mirror, so now the mirror opens the door and I don’t need to have the thing clipped to my visor. I have two different garage door openers for two different doors, and the mirror has three buttons, so I’m set. It has a sport mode that holds the gears longer for somewhat higher revs and offers up a little more power, and a weird manual shifting ability that I can’t imagine anyone would actually use. 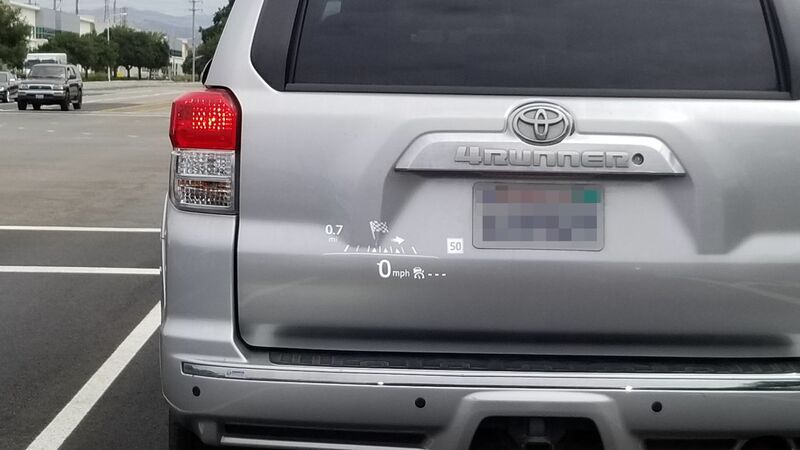 Speaking of the Heads-Up Display, in the picture below, if you look closely you can see it as it appears while parked in the garage. When driving it contains much more information yet is still easy to read and interpret. 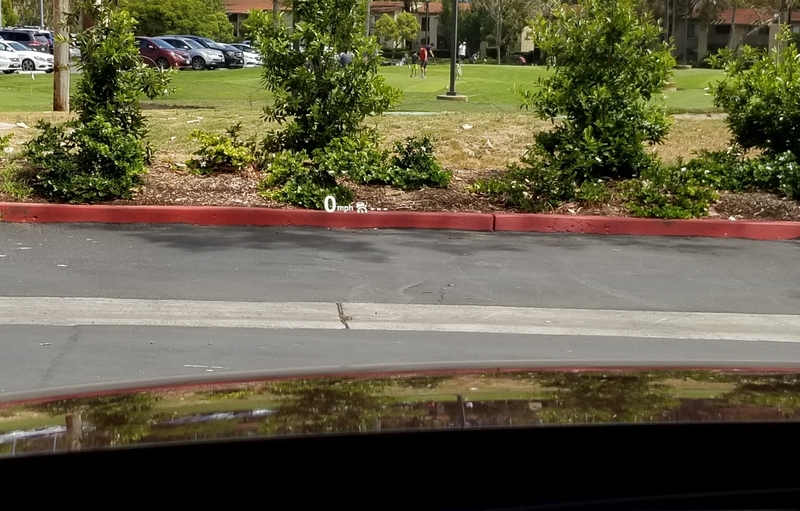 In the following image taken while driving (don’t do this, kids), you can see the speed limit sign and the current speed, as well as the indicators telling me I’m in the lane which is always good. 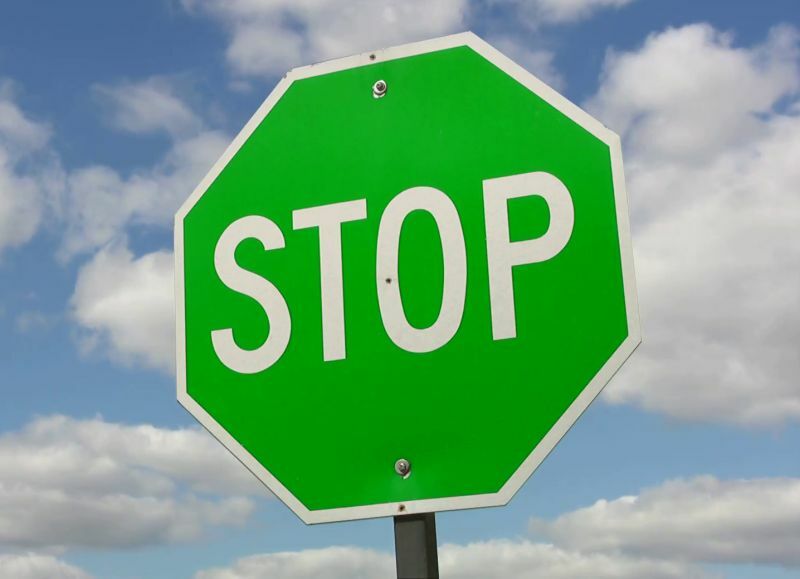 Control signs such as stop and yield can be shown, in full color and shape, concurrently with the speed limit along with the other status indicators listed above. So what about the Tucson? The one I was all ready to buy? I still like it, and I’ll even confess that it gives you much more for about the same money. It has a nice outer design, ventilated seats (not cooled, as some will say), the far superior infotainment screen and system, a rear hatch that opens if you just stand next to it, a 360-degree camera and backup camera that will show you where your car is and where it will be based on how you turn the wheel (the Mazda has a backup camera that works very well, but without that added future prediction bit). The Tucson also has a panoramic sunroof, which while nice, doesn’t actually open all the way and I have heard it suffers from some mechanical problems. The CX-5 has a moonroof and I rarely used the one in the Escape anyhow, so I suspect I’ll be fine with that. Even so, driving the Tucson just didn’t grab me. It drove well enough, but wasn’t exciting, and the interior was functional and pragmatic, but not special in any way. It offered more, but the experience of being in it and driving it just didn’t excite me or make me want to drive it, and while I can more than understand why someone would choose it over the Mazda as I almost did, I am beholden to the design, the experience, the feel of something, and in that regard Mazda just blew it away as it does to all its competitors at this price point, and some even higher. It will take some getting used to. 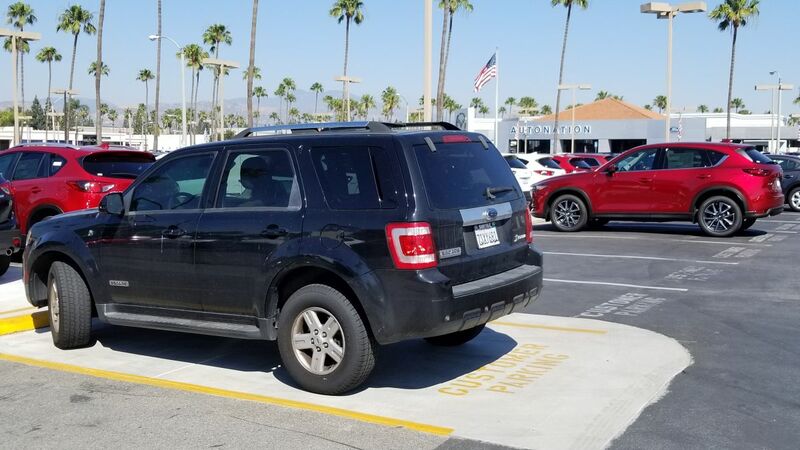 I drove the Escape for 10 years and put a lot of miles on it. The washers never worked, all the power-window risers broke at one point or another with a loud crash as the window collapsed into the door frame, the interior lights became stuck on at one point and I had to pull the fuse, the hatch didn’t always close all the way, the electronic clock didn’t even give the correct date. It told the right time and day, but not date. I think it might even have driven around on its own at night committing crimes. Yet I still felt a pang of sadness seeing it sitting in the dealer lot, dirty and looking dejected; I had to tell it goodbye. When they took away my beloved Dodge Dakota, back in 2008, I shed a tear. Curious how we become attached to, and even empathize / sympathize with inanimate objects, something we talk about in several of my classes. The old and the new. I feel sad looking at this picture. If Mazda follows through with their system / firmware update, something that should be doable through one of the car’s many USB ports, I will update this. I am following any little bit of news I get and am hoping we hear something more concrete in the near future. Try saying *that* three times fast. Also, keep in mind that Carnegie Mellon is actually a prestigious and well-respected university and dersrvedly so. That’s why the story I am about to regale you in is so bizarre. 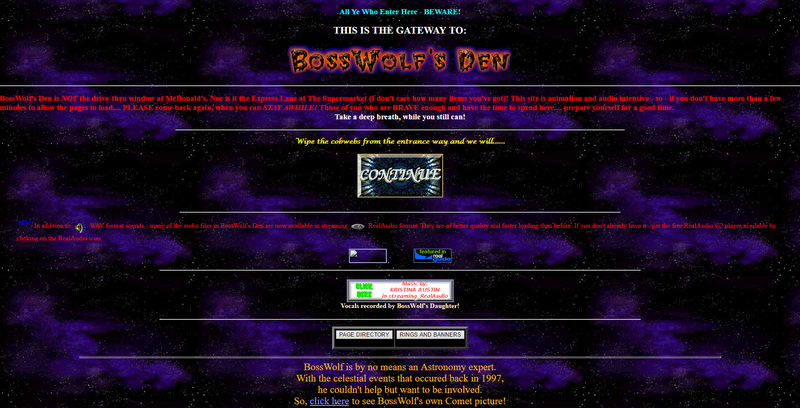 It just keeps falling down a HCI rabbit hole form which it never escapes. 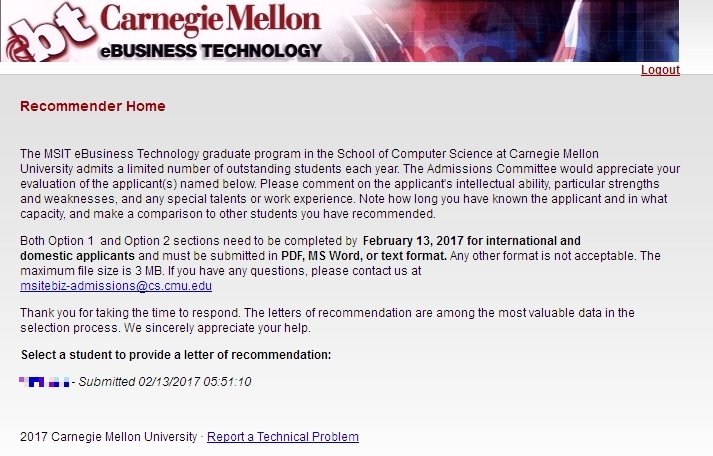 I had originally intended to post something different for this week’s random design example, however yesterday I was asked to submit a letter of recommendation for one of my former students to Carnegie Mellon’s MSIT eBusiness Technology graduate program, which by itself is a mouthful. No problem; I have done many of these before. Little did I realize that I was going to be in for an adventure. Right off the bat, it had me submit my letter, which had to be either in Word or pdf format, which was their restriction. I uploaded a Word document, and was told that format was not valid. I converted it to pdf, and that worked. 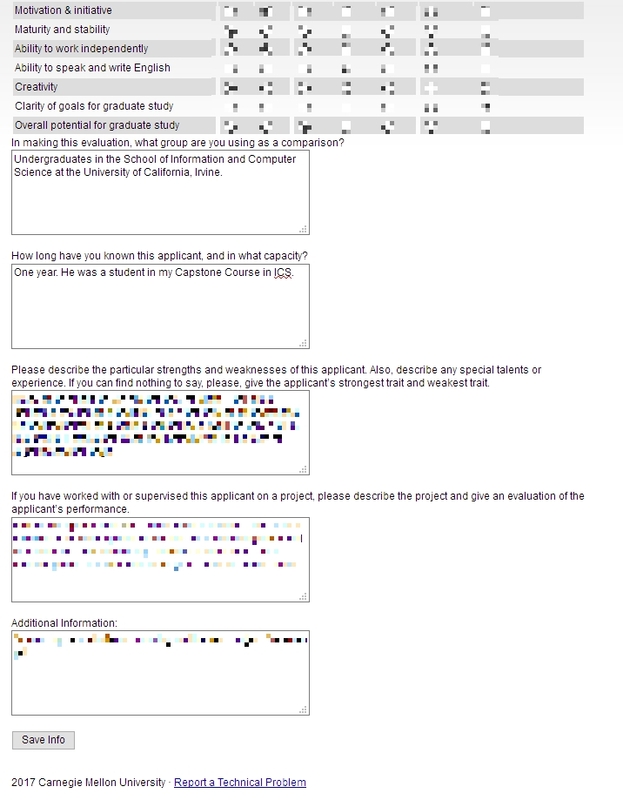 Next, I was asked to fill out some pseudo-Likert-scale questions which is common, and at the bottom of the page was a button labeled [Save Info], as seen below. The thing is, when I clicked that button, it just reloaded the page, putting me back at the top with a button labeled [Return to Recommendations]. No submit, no send, just…return. 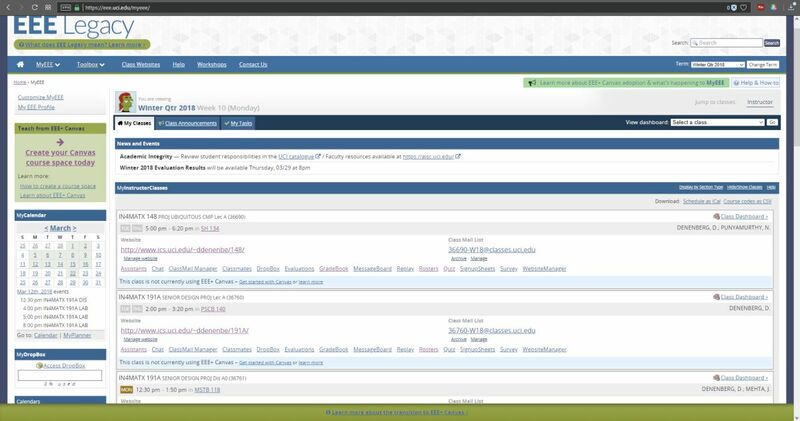 Clicking that took me back to the main page where I started, and where it still said “Select a student to provide a letter of recommendation.’ But I had already done that, and in fact it indicated the submission date right underneath, next to the student’s name. I received no confirmation, no clue as to the status of the application, or whether it had actually been completed and gone through. How many of Neilsen’s or Schneiderman’s rules does that violate? So, being the person I am, I decided I would click the link labeled ‘Report a Technical problem’ at the bottom, not minding their free-spirited use of capital letters. 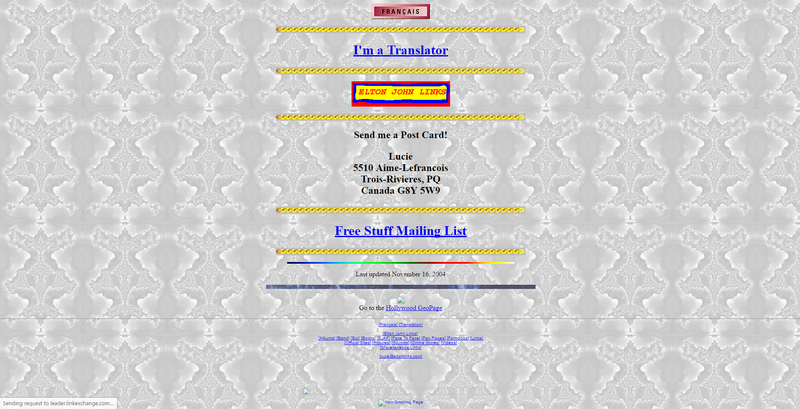 Doing so took me to a page that declared in bright yellow highlighting ‘Invalid e-mail address.’ Keep in mind I had not entered an email address, I only clicked the link. Did something happen I’m not aware of? 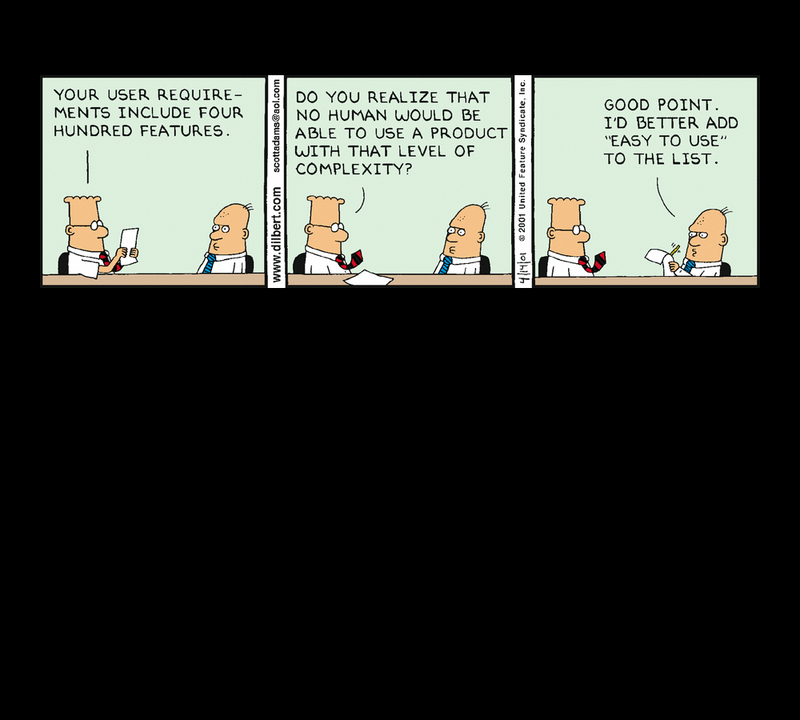 Which e-mail address, if any, is it considering to be invalid? Could it even be the one to which the form submits? 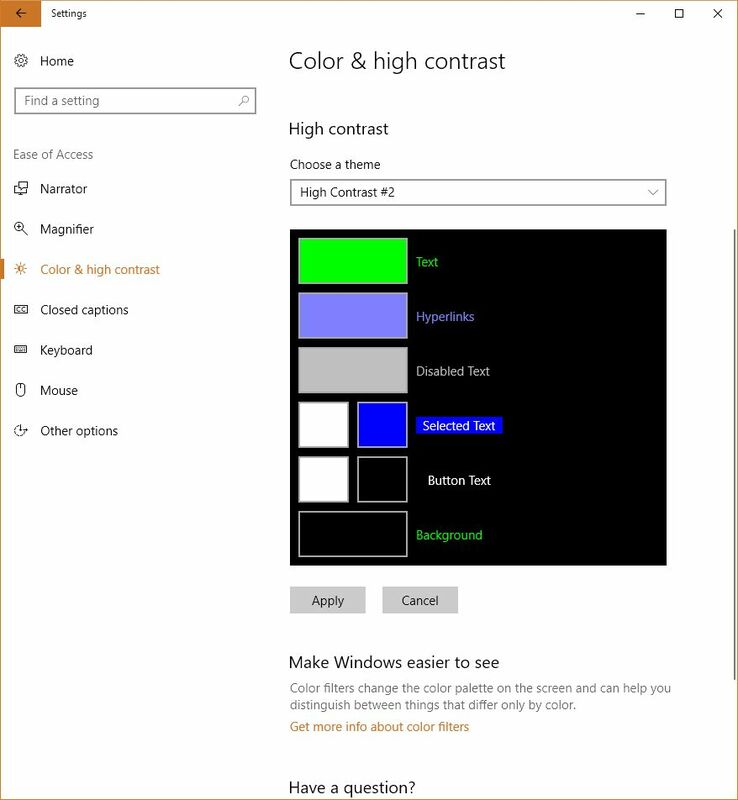 On top of that, the text box is red! This just gets better and better. Is that a red (pink, actually) text box? 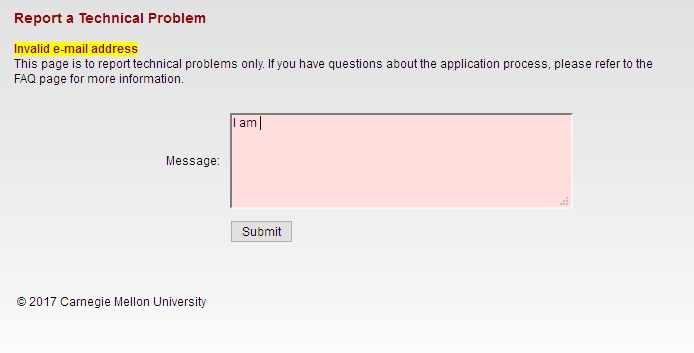 To top it all off, the message I entered in the red text box above ultimately got sent to…you guessed it…me. 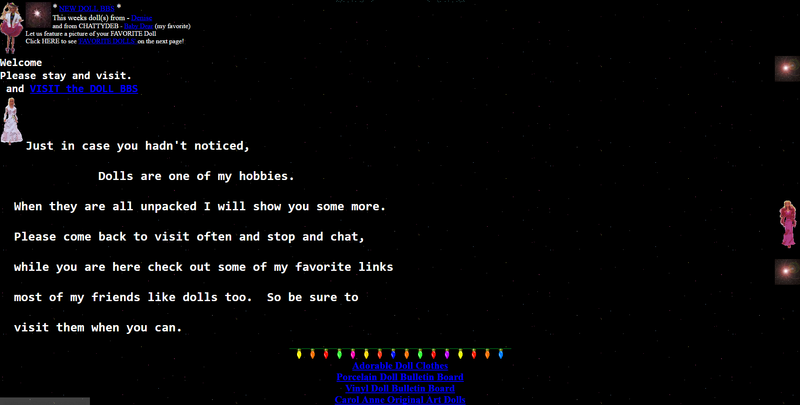 I sent another email to a contact email I found on the main page, and the follwing day received a response that all had gone through. What a travail. This was the most excruciating recommendation process I’ve ever experienced. 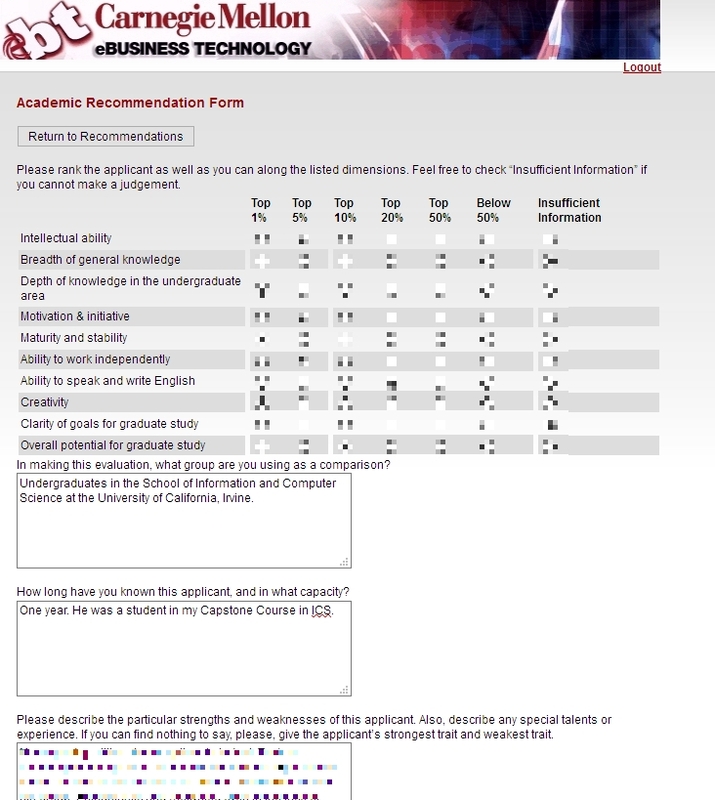 I expect more from such a prestigious university as Carnegie Mellon. At least it made for a good learning experience for us all. (Originally written for my graduate Advanced Design and Prototyping course at UCI).